Research is a continuous search for the truth or new knowledge using systematic approaches. According to Cambridge Dictionary, research is defined as a detailed study of a subject, especially in order to discover new knowledge or reach a new understanding. Educational research refers to the systematic collection and analysis of data related to the subjects of investigation. Research is the best way to take data driven decision for desired changes to happen in a particular area. However, what I can understand as a student of Education, research is a neglected area in Bangladesh education. That’s why it is difficult or sometimes impossible to take proper decision in any field of education. In recent years the pro-education government of Bangladesh has taken some steps to create opportunities for research. Establishing the Center of Excellence in English (CoE) by TQI II in Govt. Teachers' Training College (TTC), Dhaka is one of the great initiatives by the government and it can be said for sure that, after some years, it will bring a great change in English Language Teaching and Learning areas in the country. Establishing CoE in English is a fore-sighted decision by the Ministry of Education. The target of selecting TTC, Dhaka as a CoE in English is to enable the college to be the best place where the faculty would engage in teaching English language in the best possible way; train English teachers of different levels so that they can impart better English education in the country; conduct research and provide policy support to the government regarding language teaching-learning and assessment. Additionally, the CoE would organise listening, speaking, reading, writing, debating courses for the students of Education. 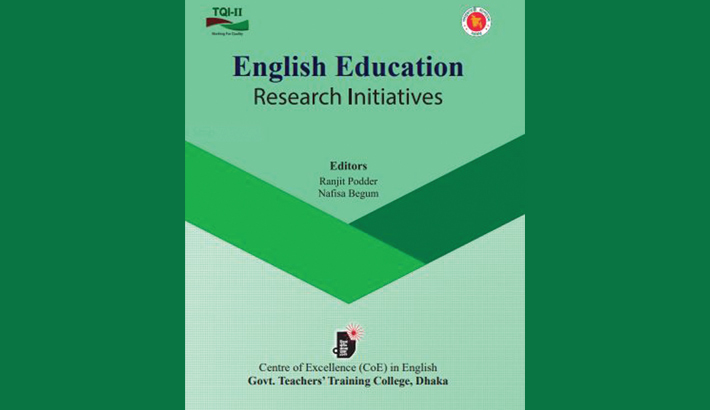 The CoE has started functioning and the first visible outcome of the CoE is the publication of a book English Education Research Initiatives containing 17 research articles by the students of Education, teachers of TTCs, NAEM, schools, NCTB, BISE, and so on. The book has been edited by two teacher educators – Ranjit Podder and Nafisa Begum. The book has been published by the CoE in English, TTC Dhaka with the financial support from just rounded-up TQI II. It is very important for the new researchers to see their research reports published in a book. It is worth mentioning that most of the researchers are new in this field and it is hoped that they all would continue researching throughout their professional lives. The readers would find important ideas which are related to English language teaching and learning; impact of teacher guides in teaching and learning English; curriculum and importance of curriculum dissemination; motivating English language learners; participatory English classrooms in Bangladesh; subject-based classrooms; using video materials in English language teacher training; issues ethnic minority students face in learning English; language testing system and classroom practices; use of English for Today books; teachers’ attitudes towards CLT; and so on. The cover of the book has been designed by Joydip Dey, a teacher educator, renowned artist and creative writer currently posted at TTC Dhaka. The price of the book is fixed at Tk. 500.00 and each copy of the book can be bought for Tk. 375 at 25% discount form Palalik Sourabh, stall no. 386, Ekushe Book Fair. And the online distributor of the book is rokomari.com. The interested readers and researchers can collect a copy from the mentioned places including CoE in English, TTC Dhaka. Although the number of educational researchers is very small in Bangladesh, it is hoped that it will increase gradually if continued support is available from government. Measures should be taken so that an excellent initiative like CoE in English is not nipped in the bud.